Margie Romney-Aslett, as reported earlier (click here for detailed article), has joined forces with Advantus and created The Girl's Paperie. While attending CHA I had the distinct pleasure of meeting Margie and talking with her about her new venture. She welcomed me very warmly and gave me a tour of her booth. As we perused the booth, I asked her a few questions. One was how she got involved with Advantus. She smiled and said something to the effect of " I have this friend, Tim." She basically said that after being let go from Making Memories she didn't quite know what to do and Tim had brought Advantus to her attention. She pushed it aside for awhile and then Advantus came to her and she decided "why not?" and gave it a go. The decision to do a booth was made in October which made getting a booth together by January a crazy undertaking by anyone's standards. However, by looking at the booth you would not think it was thrown together, but meticulously planned and thought out. It was in a word, perfect. The Girl's Paperie was originally going to be called Paper Girl. When Margie was a young girl she had a paper route, so this was the inspiration for that name. However, the name was taken and hence The Girl's Paperie came to be. One of the new releases in fact is called Paper Girl. 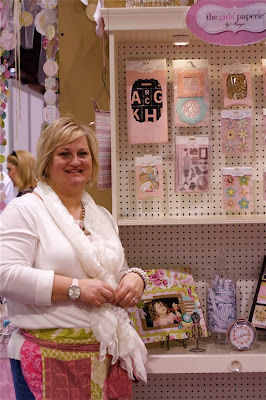 Many of you know that she started kit club called The Girl's Loft with her daughters, Megan and Brooke. When I asked her about the future of The Girl's Loft, she told me that the girl's have been doing this scrapbooking thing a long time. Megan and Brooke will be running the kit and she has every confidence in them that they will continue to be successful. This woman, whom I had never met previously, treated me like an old friend. Thank you for that Margie. I truly had a wonderful time in your booth! 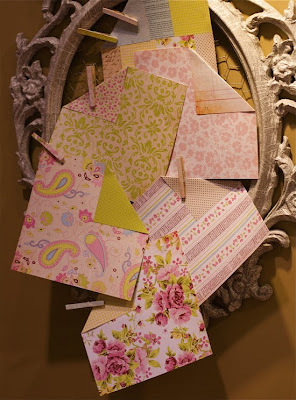 Margie's new line looks beautiful - look forward to seeing everything in person! Love "The Paper Girl" line. Can't wait to see the rest of Margie's stuff. And the kits look really great too. Aren't we lucky Advantus partnered up with Margie. I have loved reading every thing written about her displaying at CHA-W along with the rave reviews which were rightly deserved. 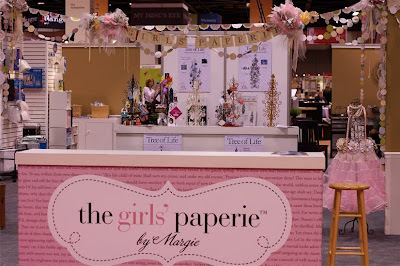 I also think The Girl's Paperie name fits the style of Margie's creativity and certainly stands out with the special wording of "Paperie". Love it all!